Get all the wonderful health benefits of turmeric, in particular its potent antioxidant and anti-inflammatory properties, by incorporating it into this delicious and easy to make smoothie. Turmeric has been used in Indian Ayurvedic and Chinese medicine for centuries because of its superior health promoting properties. In the health circles I hang out in I feel like this “super spice” is being talked about more and more, primarily because of its superior anti-inflammatory action. With inflammation at the root of so many illness such as arthritis, it’s important to include anti-inflammatories into your diet. With turmeric you get much more than a reducer of inflammation though. Here’s a quick rundown of turmeric’s other health benefits. Try adding turmeric to other dishes as well. I’ve been sprinkling it on my scrambled eggs lately with a little black pepper. Black pepper and turmeric work synergistically to enhance each others health benefits. I’ve yet to try black pepper in a smoothie though. Turmeric can also be used topically to treat skin irritations, but be forewarned, your skin will be stained yellow. In reality you can add a dash or two of turmeric to any smoothie without any noticeable difference in taste. I like to add turmeric to my post-workout smoothies to help with inflammation and lactic acid buildup, and ultimately recover faster. Enjoy! Place all of the ingredients into your high-speed blender and blend away for around 30-45 seconds or until nice and smooth. I’d love to know if you tried and enjoyed this tasty turmeric smoothie – please do tell in the comments below. Happy Blending! WOW! I’ve been adding turmeric now to my morning protein smoothie– 1 cup of almond milk (home made), 1.5 frozen bananas & 1 scoop of vanilla whey protein and its delicious! That sounds like a morning protein smoothie I could get down with. Nice work on the homemade almond milk. Cheers! I just pulled out my bottle of turmeric today. I have been feeling achy in my joints and I can only assume it’s due to inflammation. I drink a daily smoothie of spinach, 1/2 banana, blueberries or strawberries, and almond milk. My Google question was whether or not turmeric could be added to smoothies and your link came up. Thank you. Can you tell me how much turmeric I should add? I also add to my aforementioned smoothie; 2 tablespoons rice protein, 2 tbsp. golden whey, 1 tablespoon of cocoa powder. I will now add a tablespoon of coconut oil if that will help with the turmeric. Start with 1/2 teaspoon of turmeric and work your way up to as much as a tablespoon, or as much as you can without sacrificing the tastiness of your smoothie. Turmeric, coconut oil, and the rest of those ingredients will make for one healthy smoothie! Great smoothie. I added 1/2 banana, tablespoon of chia seeds and 3 stalks of kale (spine removed. I didn’t bother with a sweetening agent and it tasted just fine. Nice add-ons, Samantha, and I love the absence of a sweetener – healthy indeed! I have been using turmeric for a few month now mixed with water. From searching online i have realised turmeric needs to be mixed with a source of fat to work in your system? Anyway today i made a turmeric mixed berries lemon banana ginger spinach oat honey sunflower seed smoothie with a dash of milk! It was amazing. I’m not familiar with consuming turmeric with fat to increase efficacy. If true, I would add coconut oil to your smoothies to take advantage of this. I do know that turmeric and black pepper consumed together potentiate each others health benefits. Not ideal for smoothies, but other dishes. I take a turmeric shot every morning. The recipe is 4 lemons juiced,1 1/2 cups of coconut water. 1tsp. cayenne pepper, and 2 tsp of turmeric powder. I put it in a mason jar and it’s enough for a whole week. It’s just a shot glass full every morning. That sounds absolutely fabulous, Maggie! I’m on an anti-inflammation crusade after having been diagnosed with Chronic Inflammatory Disease and Costochondritis. This smoothie was my breakfast today with a couple of changes. I subbed a half teaspoon of flax oil for the coconut, added a fresh raw beet, and used frozen organic raspberries in place of the blueberries, as I read somewhere that blueberries, eggplant, tomatoes, potatoes and peppers may increase inflammation. I got a delicious, gorgeously colored smoothie that tasted wonderful. Thank you for this recipe. It will be a regular part of my rotation! Flax oil in place of coconut, raspberries instead of blueberries, and a fresh raw beet are great tweaks to the original recipe. Love to see you making it your own! I’ve never heard of blueberries causing inflammation, actually just the opposite. The article below detailing the health benefits of blueberries states that their unique phytonutrient profile function both as antioxidants and as anti-inflammatory compounds in the body. Has the Anti-inflammatory smoothie worked for you. Just curious, think I may have alot of inflammation and want to fix it. Eggplant, tomatoes, potatoes and peppers are all part of the nightshade group of veggies, which do indeed contribute to inflammation. Bluberries, however are not a part of that category. Excellent article share Ryan! Go without any of these nightshades (none at all–none) for a couple of weeks. Then reintroduce after two weeks and see hiw you feel. Best wishes. You might be one of the lucky ones that can have nightshades! Hi Ryan- I know Turmeric acts as a blood thinner, just want to know if it’s safe to include in a smoothie along with other ingredients like celery, apple, parsley, coriander or cilantro, blueberries, coconut oil, flaxseed oil etc. Also, how big a dose of Turmeric powder should I use? I am approx. 250lbs. Yes, turmeric is safe to blend with those other ingredients. Start with 1/2 teaspoon and work your way up to 1 heaping tablespoon of turmeric. Selecting organic, preferably locally grown, fruits and veggies for your smoothies goes without saying. I don’t emphasize this in every recipe to avoid sounding like a broken record ;) I hope you enjoy this smoothie. Thanks for sharing your own tasty turmeric recipe! I like the coconut milk and the chilly to spice it up was a brilliant addition. 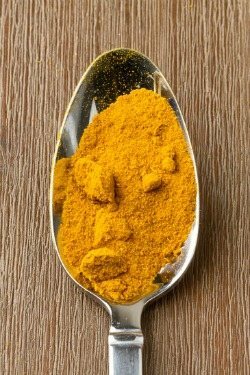 Hey :) Can you provide clarity on how turmeric is effective consumed when raw? I believe it is too! The health benefits listed above all apply to raw turmeric. Consuming with fat and black pepper increase its effectiveness. can i mix turmeric with just bannas/strawberry spinach /honey i suffer asthma.i heard turmeric is good for it. Yes, that combo will work, Wee. Can these smoothies be frozen and will they still maintain their nutritional value if so? Yes, they can be frozen and will maintain their nutritional value for a several weeks. Sometimes I let them thaw completely in the fridge, other times I eat them mostly frozen. I rarely re-blend. Hi, I made a smoothie today with fresh tumeric root, a banana, honey and water… It was not tasty at all which is why I went searching for tumeric smoothie recipes and found your site… Can you guide me on how much fresh tumeric root to use, I think I used too much. And, do you have a suggestion for an alternative fat instead of coconut oil? Thank you!! Try either avocado or butter in place of coconut oil. How many turmeric roots should you put in your smoothie? Start with a small piece of fresh turmeric root – about 1/4 teaspoon. Increase or decrease that amount depending on how your smoothie turns out. Cheers! If you don’t like pepper, swallow 2 whole peppercorns with your tumeric smoothy. It taste like punpkin good! But what benefits do we reap from drinking this and how often should we to see benefit as my dad has diabetes and it would help him. Glad you like it, Jenn! The primary benefits are from the turmeric, which are listed above. As with any ingredient or smoothie the benefits one experiences will be unique to the individual and depend on other factors such as overall diet, age, and lifestyle. Do you think I can add turmeric to this and not really notice the taste? That’s a good question, Georgia, that I don’t have a definitive answer for. I’d try adding a little turmeric and see if you taste it. I started adding turmeric with a dash of black pepper to my morning green smoothie every day, and I rarely taste it, under the cup of raw spinach, 1/2 banana, peanut butter and cinnamon, it’s masked easily. If you add a protein powder I would imagine you’d taste the powder more than the turmeric, or at least that’s what happened with me. I added GNC chocolate protein powder and didn’t taste the turmeric at all. Added a few carrot slices and it’s even more delicious. Keeps me full until lunch. Glad to be doing it for all the health benefits it claims. Thanks for all the fantastic suggestions! I occasionally have a mug of turmeric (golden) milk for a fantastic night of sleep but the smoothie can be a fantastic way to up the turmeric intake. The coconut oil and black pepper don’t taste but are essential. Thanks again, I’ll let you know if I come up with any great recipes. You’re welcome, Rookiebird. Golden milk is nutritious and delicious! Please do send over any recipes you create. I make my morning smoothies with a tablespoon of turmeric, as much kale that will fit, half avocado, 1/4 cup whole oats, tablespoon peanut butter, teaspoon honey, tablespoon coconut oil, apple, a banana and 1/2 cup orange juice. I think it tastes great! Is there anything I should tweak? I’m trying to lose about 65 more pounds. I’ve changed my eating habits and types of food and have started cardio and squats, push ups and leg lifts also. “as much kale that will fit” – love that :) Your smoothie is excellent, Maria. My only suggestion is to reduce the sweet fruit a little if you can. Try 1/2 banana and/or replacing the orange juice with water. Can diabetics use it, how much and what effects would it have. I Have just been diagnosed with A-Fib and been placed on Eliquis. I am 82 and have never taken any drugs so this is pretty traumatic for me. I have been using fresh Turmeric in my smoothies for about 3 months. Prior to that I used the powder. Is Turmeric off limits for me. Whether or not you can continue consuming turmeric now that you’re taking Eliquis is a question for your doctor or a qualified medical professional, Alice. Thank you for sharing this recipe. I can hardly wait to try it. My question is: can I sprinklr tumeric on my dogs food? i.e., is this safe for dids? I have a Golden and they are prone to hip joint problems. Trying to be proactuve here. I give him a dauly dose of Glucosomine. However, you might want to check with your vet first. Yes, this recipe is safe for kids. Thanks for give a best suggestion about turmeric, it’s really best for our body. It’s definitely a superstar, Selena. Yes, powdered turmeric can be use in this recipe, Sylvia. Hello Ryan, I have hypothroid and was wondering what benefits powdered turmeric in my daily smoothie routine will have? I can’t speak to the effects of turmeric on hypothyroidism from personal experience or study. However, a quick Google search turned up anti-inflammatory and antioxidant properties of turmeric being beneficial for hypothyroidism. I encourage you to do some additional research. Even if turmeric doesn’t directly help with hypothyroidism, it’s good for some many other things that support your health there’s no reason not to consume it, IMO. I made my Turmeric protein smoothie after my workout. Fantastic, Tina! I love when people take my recipes and make their own versions. Hi I would love to know what liquid you usually recommend for smoothie. I use tumeric, black pepper, banana , sometimes coca , greens kale or what ever is available. What do you think would work best water, almond milk, soymilk etc. I am dairy free. Thanks! Either almond milk or water (or tea) if dairy free, Sue. Leave a Reply to Ryan Carmody Click here to cancel reply.